This report is basically the same as the reports you have received in the past, very little has changed. Testing of our water supply system to be sure the drinking water the Village of Montgomery delivers to your home or business remains safe continues. In some parts of the Village we are still experiencing brown water at times. The water even though it has been discolored, meets all Health Department standards for safe drinking water. The Department of Public Works will be flushing hydrants beginning with the week of April 21st – April 25th 2008. Again, you will experience some brown water during this period. When the brown water occurs run your water until it clears, (usually about 5 minutes). All water samples taken during 2007 from water delivered to our residents were negative. All water delivered to the consumer was safe to drink. The water is treated by disinfection with chlorine to destroy microorganisms prior to delivery to the customers. The NYS DOH has completed a source water assessment for this system, based on available information. Possible and actual threats to the drinking water source were evaluated. The state source water assessment includes a susceptibility rating based on the risk posed by each potential source of contamination and how easily contaminants can move through the subsurface to the wells. The susceptibility rating is an estimate of the potential for contamination of the source water, it does not mean that the water delivered to consumers is, or will become contaminated. See “table of Detected Contaminants” for a list of the contaminants that have been detected. The source water assessments provide resource managers with additional information for protecting source waters into the future. As mentioned before, our water is derived from four drilled wells. The source water assessment has rated these wells as having a medium-high susceptibility to microbials, nitrates, industrial solvents, and other industrial contaminants. These ratings are due primarily to the close proximity of a SPDES permitted discharge facility ( industrial/commercial facilities that discharge wastewater into the environment and are regulated by the state and/federal government), the low-level residential activity and the pasture that is located in the assessment area. In addition, the wells draw from fractured bedrock and various aquifers and the overlying soils may not provide adequate protection from potential contamination. While the source water assessment rates our well as being susceptible to microbials, please note that our water is disinfected to ensure that the finished water delivered into your home meets New York State’s drinking water standards for microbial contamination. A copy of the assessment, including a map of the assessment area, can be obtained by contacting us, as noted in this report. This year the Village will be installing a new 8" water main on Wallkill Avenue between Senior Street and Mason Street. Also, a new 8" water main will be installed on Railroad Avenue between Mason Street and Boyd Street. Both will replace a deteriorating 4" water main. 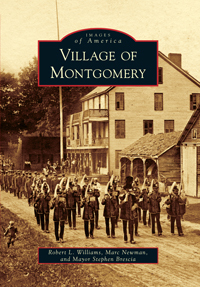 The Village was able to obtain a grant of $300,000 from Orange County Community Development to help fund the project. To comply with State and Federal regulations, the Village of Montgomery, will be annually issuing a report describing the quality of your drinking water. The purpose of this report is to raise your understanding of drinking water and awareness of the need to protect our drinking water sources. Last year, your tap water met all state drinking water health standards. This report provides an overview of last year’s water quality. Included are details about where your water comes from, what it contains, and how it compares to State standards. If you have any questions about this report or concerning your drinking water, please contact Department of Public Works Superintendent Ralph Nelson at 457-5321. We want you to be informed about your drinking water. If you want to learn more, please attend any of our regularly scheduled Village Board meetings. The meetings are held the 1st and 3rd Tuesday of each month at 133 Clinton St., Montgomery, NY. In general, the sources of drinking water (both tap water and bottled water) include rivers, lakes, streams, ponds, reservoirs, springs, and wells. As water travels over the surface of the land or through the ground, it dissolves naturally-occurring minerals and can pick up substances resulting from the presence of animals or from human activities. Contaminants that may be present in source water include: microbial contaminants; inorganic contaminants; pesticides and herbicides; organic chemical contaminants; and radioactive contaminants. In order to ensure that tap water is safe to drink, the State and the EPA prescribe regulations which limit the amount of certain contaminants in water provided by public water systems. The State Health Department's and the FDA's regulations establish limits for contaminants in bottled water which must provide the same protection for public health. Our water system serves approx. 3800 people thru approx. 1400 service connections. The total water produced in 2007 was 99,451,000 gallons. The daily average of water treated and pumped into the distribution system was 272,468,000 gallons per day. Our highest single day was approx. 464,000 gallons. The amount of water delivered to customers was 86,285,000 gallons. This leaves an unaccounted for total of 13,166,000 gallons. This water was used to flush mains, fight fires and water main breaks. Water customers were charged $2.52 per 1,000 gallons of water plus $10.00 minimum use for 4,000 gallons. It should be noted that all drinking water, including bottled drinking water, may be reasonably expected to contain at least small amounts of some contaminants. The presence of contaminants does not necessarily indicate that water poses a health risk. More information about contaminants and potential health effects can be obtained by calling the EPA's Safe Drinking Water Hotline (800-426-4791) or the Orange County Health Department at 2911331.
system disorders, some elderly, and infants can be particularly at risk from infections. These people should seek advice from their health care provider about their drinking water. EPA/CDC guidelines on appropriate means to lessen the risk of infection by Crytosporidium, Giardia and other microbial pathogens are available from the Safe Drinking Water Hotline (800-426-4791). The level presented represents the 90th percentile of the 20 sites tested. A percentile is a value on a scale of 100 that indicates the percent of a distribution that is equal to or below it. The 90th percentile is equal to or greater than 90% of the copper values detected at your water system. In this case, twenty samples were collected at your water system and the 90th percentile value was the third highest sample taken which was .52 mg/l. The action level for copper was not exceeded at any of the sites tested. The level presented represents the 90th percentile of the 20 sites tested. A percentile is a value on a scale of 100 that indicates the percent of a distribution that is equal to or below it. The 90th; percentile is equal to or greater than 90% of the lead values detected at your water system. In this case, (20) samples were collected at your water system and the 90th percentile value was of the third highest sample taken which was 008 mg/l. The action level for lead was exceeded at one of the sites tested with a value of 56 ug/l. This home had been vacant prior to testing and should have been excluded from this round of testing.